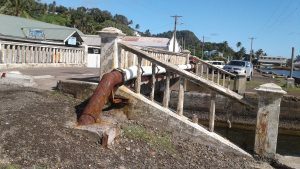 The reconstruction work on the new Market Bridge in Levuka will commence from next week Monday (April 10). This was confirmed by the Fiji Roads Authority (FRA) Chief Executive Officer John Hutchinson. In the interim, motorists are advised to use the detour posted along Bobbis Lane, Bowling Green Road and Chapel Street. He said the original bridge was not safe for vehicle and pedestrian use due to the deteriorating condition of the bridge superstructure and required an immediate replacement. Mr Hutchinson said the cost of the bridge is approx. $3m and is part of the Design and Construction of Six Short Bridges programme. The new bridge is expected to be completed by December, weather permitting.